the crime segments: Temporary Perfections, by Gianrico Carofiglio; the wall and where do I go from here? 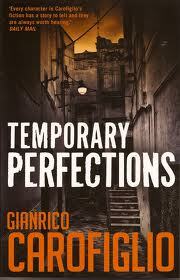 Temporary Perfections, by Gianrico Carofiglio; the wall and where do I go from here? I've hit that all-too familiar wall of finishing all of the books currently offered in a series; I'm at that place where there's nothing to do but hope for more in the near future. It used to be that this kind of break really bugged me and actually made me a bit sad for a while, but as I've gotten older and as my TBR pile has become rather huge (thanks mostly to Maxine at Petrona and Karen at EuroCrime), I have plenty to read while I wait not so patiently. The problem is that having now come to the end of all of the published Guerreri novels by Carofiglio, I have no clue where to go next in my reading. These books are well written, have a great depth of character -- seriously, how can you not love a man who has a punching bag as a silent therapist? -- and appeal to my need for intelligent fiction, traits that I look for in any book, especially in crime-based novels. Carofiglio and Guido Guerrieri are both tough acts to follow -- and right now I'm hoping I have something on the shelves that measures up. Any suggestions are most welcome. Now to the book: Temporary Perfections finds Guerrieri taking on the role of investigator outside of his legal practice. A student named Manuela Ferraro has disappeared, and through her parents' attorney, Guido is hired to try to pick up her trail after the official channels have all been exhausted. This is not a role in which Guerrieri is comfortable, but he agrees to do it all the same. Her ex-boyfriend's attorney forbids him to speak to Guerrieri, and when Guido talks to her reluctant friends, he senses they're holding things back. His job is not going to be easy and he knows it, especially with Manuela's friend Caterina, who has her own agenda. Guerrieri has come a long way since events in Reasonable Doubts -- he now has associates in his new office, but he's still a lonely guy, who feels like his "emotional life is like a silent movie." He shares his thoughts with his punching bag, the "perfect therapist," who "never judges," "listens, and never interrupts." His nocturnal ramblings take him to a bar where he runs into an ex-client, a former prostitute named Nadia whose , and he finds in her someone to discuss movies, books and life. Once again, Carofiglio has given his readers an intelligent read. As always, even the characters who seem to have only minor roles play a big part in helping to explain how Guerrieri understands human nature as well as himself. There is also a continuing dialogue throughout this and all of the novels in the series about the Italian system of justice and crime, and the sense of place takes you away for a while, whether Guerrieri's in Bari, along the coast at a seaside restaurant, or in Rome as he gets the clichéd thrill of climbing the Spanish Steps. I can't really do this or any of the other books real justice in only a few paragraphs; these are novels you have to experience for yourself. They are not wild rides but should appeal to anyone who is looking for a higher level of intelligence in his or her choice of books, or to people who care about the development of character throughout a series. Such a great series! My thanks to Bitter Lemon Press for making these available to the English-speaking public. Ciao, but just for now, Guido.